(HHS) department. If confirmed by the Senate, Azar will be one of few HHS secretaries to have come from an industry the HHS regulates, rather than from a career primarily in government. The previous chief of HHS, Tom Price, stepped down from the position in September following reports that he had used unnecessary and costly private charter flights at taxpayers’ expense. For most of the last decade, Azar worked for the US branch of the global pharmaceutical company Eli Lilly—he was the division’s president from 2012 to early 2017. Before that, the Yale Law School graduate worked as HHS deputy secretary for the George W. Bush administration. 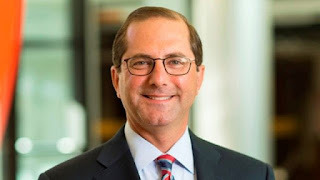 If confirmed, Azar will be responsible for overseeing the running of the Affordable Care Act (ACA), Medicare, Medicaid, and the National Institutes of Health, with a budget of more than $1 trillion—more than any other single federal agency.